A worthy sequel to The Hustler (1961), The Color Of Money catches up with pool shark Eddie Felson in middle age, as he is about to be shaken away from the comforts of retirement. With effortless potency, Paul Newman reprises the role that he made famous, and finds a man ready to trade contentment for another shot at glory. 25 years after being forced to retire from shooting pool for money, Eddie Felson (Newman) is living a comfortable life, running a small bar, trading in alcohol, enjoying his girlfriend Janelle (Helen Shaver), and bankrolling mediocre hustler Julian (John Turturro). 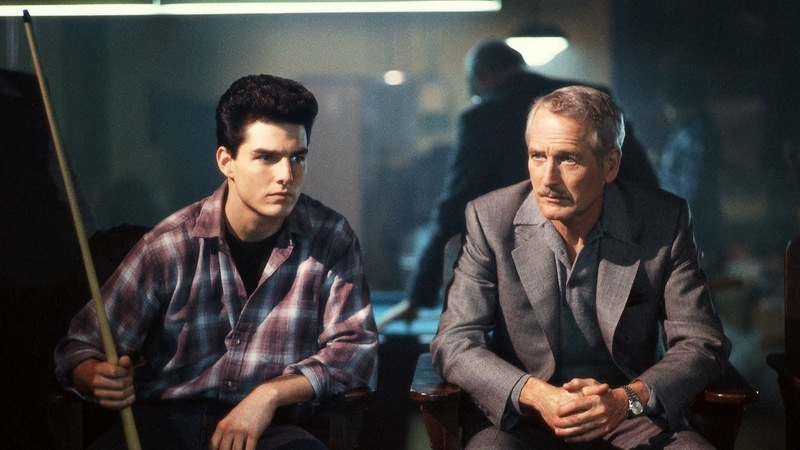 One evening Eddie spots young pool hot shot Vincent Lauria (Tom Cruise), and immediately recognizes a natural but guileless talent. Eddie eventually convinces Vince and his girlfriend / manager Carmen (Mary Elizabeth Mastrantonio) to join him on a road trip to a tournament in Atlantic City. Along the way, they stop at derelict pool halls where Eddie tries to train Vince to become a hustler. But Vince hates to lose, even when losing means setting up a bigger payday. Meantime, Eddie starts to get the itch to pick up a cue and play again. Well before the trio reach Atlantic City, Eddie reaches a moment of truth, where he has to decide either to continue investing in Vince or to reactivate his own life. To continue the story of one of the more compelling characters in movie history, director Martin Scorsese glamorizes shooting pool while celebrating the road trip grime that makes the world of hustling in small town halls irresistible to the Eddie Felsons of the world. The Color Of Money cruises as smoothly as Eddie's Cadillac, slicing through side streets filled with scrappy dives and the men who occupy them, waiting for the next mark to walk through the door. The Color Of Money has a few too many stylish close-up shots of balls rolling on pool tables, Scorsese apparently hooked on the admittedly elegant sights and sounds of the game. From the satisfying thwack of the break to trick shots and near misses, the film immerses itself into the 9-ball culture, and unusually spends a lot of time on actual games scenes. This unnecessarily prolongs the film to two hours, and interrupts the more interesting character development aspects. And it is the character of Eddie Felson, a full generation after the events of The Hustler, that is the centre of the film. The Color Of Money is the reawakening of Felson's soul from the purgatory of self-imposed pool exile, a journey sparked by his discovering of the next bright young thing in Vince, and more importantly, rediscovering the intoxicating allure of life on the road. Eddie belongs in the dank pool halls where he can smell the money and spot the players within seconds of entry, and his tutorship of Vince becomes a vehicle for reigniting his one passion in life. Newman finally won his Best Actor Academy Award for a classy performance filled with middle age regret and renewed determination. Newman starts with a fulfilled Eddie not looking for any transformations, and ends with him finding renewed vigour, a lust for competition propelled by the need to make up for many years of lost time. Tom Cruise holds his own opposite Newman, infusing Vincent with the slightly irritating exuberance of youth, naturally accompanied by smug cluelessness. Mary Elizabeth Mastrantonio exudes a cool detachment that may be attributed to an underwritten role, as the ambitious businesswoman who happens to be caught between her boyfriend and his mentor. In an early film appearance, Forest Whitaker has a small but critical role as a low key hustler. For Eddie Felson, The Color of Money proves to be the green elixir that nourishes life.